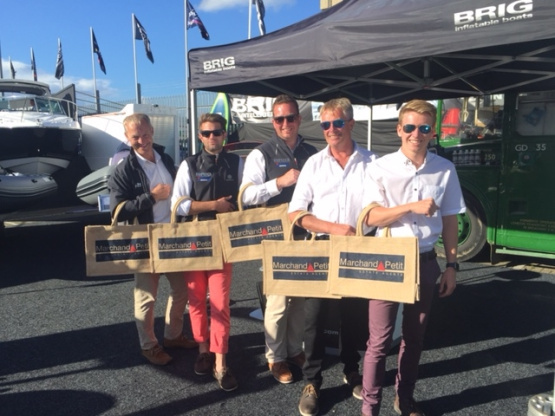 Following the huge success of Marchand Petit’s collaboration at the London Boat Show earlier this year with The Wolf Rock Boat Company, the Directors are delighted to announce that the teaming up once again with the local distributor of BRIG UK at the Southampton Boat Show this month, was of great benefit to both companies. The Southampton Boat Show attracts a wide variety of potential buyers from across the South Coast, London and beyond. BRIG ribs are becoming the stylish and reliable rib of choice, particularly in the Salcombe & Kingsbridge Estuary and other South Hams coastal locations where Marchand Petit Estate Agents has 6 offices and a leading local and national reputation for property sales and lettings. For buyers relocating or acquiring second homes in the area, a boat becomes the next all important accessory. The extensive range of ribs offered by BRIG UK appeal to those new to the water, requiring tenders for yachts, as well as those looking to upgrade or purchase more sophisticated, larger models for recreational offshore use. The Marchand Petit’s property specialist team, attending during the fortnight of the show’s duration, were there to offer expert advice on the pleasure and life style advantages of living in the picturesque South Hams and, together with their colleagues at The Wolf Rock Boat Company the home of BRIG UK, the collaboration provided a powerful platform and introduction for potential buyers and current clients alike. “The combined results and on-going interest from buyers for BRIG UK and Marchand Petit was a great acknowledgement of successful team work and heartening as we continue to celebrate our 25 years in property this year,” added Gordon Maunder, Company Chairman. For further details contact Marchard Petit on 01548 844473 or online www.marchandpetit.co.uk and The Wolf Rock Boat Company on 01548 855751 or online www.thewolfrock.co.uk.